Denny Hamlin participated in two truck practices in preparation for tomorrow’s truck race. He was 10th in first practice. 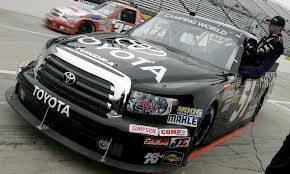 The #51 Toyota Tundra team seemed to have it together as Denny placed first in final practice. Tune in for qualifying and the race tomorrow as Denny looks to capture his second consecutive victory at Martinsville.